You might have missed it, but county law libraries made a surprise appearance in the Minnesota legislative session this spring. You can read the original Senate File 1113 here, which would have allowed for the diversion of county law library funds for construction of a courthouse. This legislation passed both the Senate and the House, but was vetoed by Governor Dayton. But bills concerning county law libraries could always come up again at the capitol. 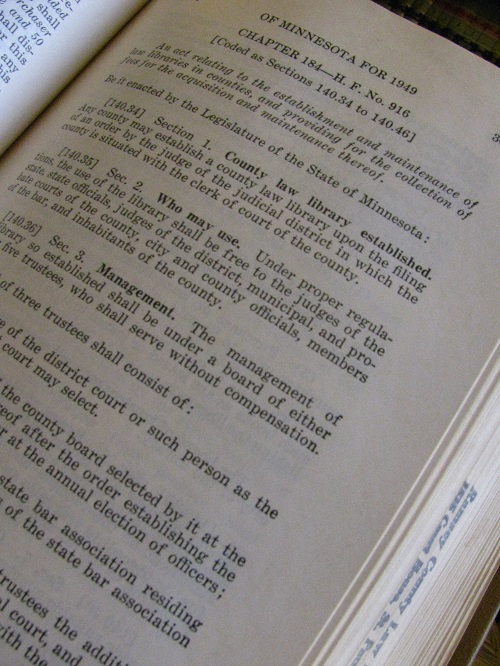 Without examining now-vetoed bill, this occurrence presents an opportunity to consider some history behind county law libraries in Minnesota. Their modern incarnation formally came into existence with what became Minnesota Statute §134A. You can read in the 1949 Session Laws wherein the Legislature laid out the specifics for the establishment, operation, and function of county law libraries. This original text reveals that amazingly little has changed to the county law library statute over the years, such as which sectors must be represented on governing boards, how funding is to be provided, and who must be allowed to use the libraries. Keep in mind that this was all back in 1949, predating modern “access to justice” efforts. Of course, what might have been casually called a ”county law library” existed in Minnesota prior to this statute, often growing from local bar association libraries. (This was how the Hennepin County Law Library got its start way back in 1883.) But the original statute overwhelmingly set the standards for our modern county law libraries. Today you can find county law libraries throughout the state, and this brochure from the Minnesota Coalition of County Law Libraries (MCCLL) lists those which offer professional staff to assist users. But history-wise, its not easy to determine when Minnesota’s various county law libraries come to be. Public law libraries existed in St. Paul, Minneapolis, and Duluth back in 1955, as evidenced in this article in the Law Library Journal about the founding of the Minnesota Association of Law Libraries (MALL). Since this sort of historical information can be elusive, we would like to know more about the history of your county law library (including this library). If you have any such inside knowledge, please share it with us. And- if you have found the services and resources of your county law library helpful, by all means tell your legislator!